Why can't I stop gambling? This is a question people often ask themselves. The appeal of gambling is obvious: it is fun, colourful, competitive, with the chance of winning money. But our inability to stop gambling is puzzling. Why can’t we just decide to stop – and then stop – using willpower? The answer lies in the film Back to the Future II. You’ll remember that in the film Marty McFly goes forward in time to the year 2015. He sees a sports almanac in a shop and realises that it has all the results in it from 1950 to 2000. All he has to do is go back in time again, then bet on enough results, and win big! Unfortunately life is not so simple – even in the movies – and his schoolboy enemy Biff steals the almanac and places the bets himself. In real life, you don’t know all the results in advance. So you are pleased when your bets come off, because you weren’t sure it was going to happen. Imagine if you had 100% certainty that your result was going to come off – like Biff did. Actually it would be pretty boring. The only benefit would be the money building up in your bank account. Gambling would become a chore. If 100% of your bets paid out, this would be a continuous reward ratio. This produces good results at first, but soon becomes dissatisfying. Anyone who’s had a dog knows the principle – that you can reward a puppy each time it comes back to you, but then you need to make the rewards unpredictable because otherwise it gets bored and it stops coming back to you. What makes gambling exciting – and addictive – is that it works on a variable reward ratio. The unpredictability of a roulette wheel, or a football result, or any other thing we can bet on, is what makes it exciting to us. It’s the thrill that the next bet could come off and be your Big Win. There’s no Back to the Future almanac in real life; no certainty. This is what makes gambling such a bad bet. The one thing you can be sure of is that the house always wins in the long term. 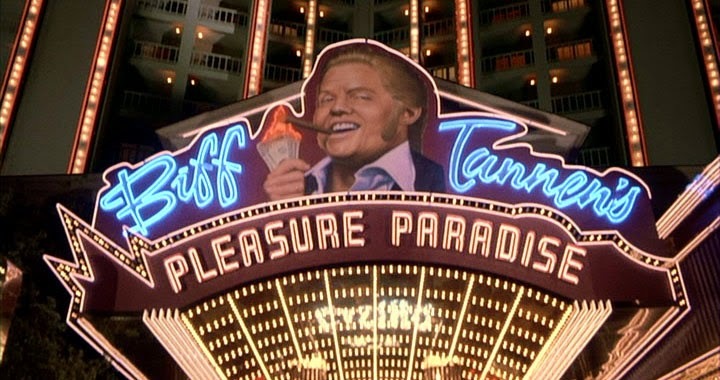 Even in the film Biff ended up running the casino and a violent empire in Hill Valley - Biff didn’t stay a punter. So the house always wins – and takes a 15% profit margin in fact. Every bet is a bad bet as it takes you closer to losing. The more you bet, the more likely you will lose your money. If you want to give up gambling then think about the future and not the past - with Better Futures for Gamblers. For more on how machines are designed to be addictive using variable rewards, see the excellent interactive piece by The Guardian below.